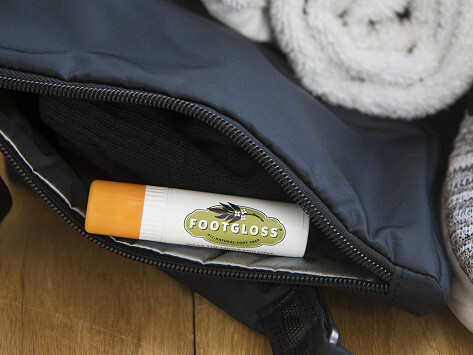 FootGloss acts as a barrier between your skin and your shoes, preventing chafing and irritation. Created with all-natural ingredients like beeswax and olive fruit oil, this balm lets you wear every pair of shoes you own—even the ones that usually rub you the wrong way. Dimensions: 3.25" x 0.75" x 0.75"
I can wear my Sperrys Now! Have your shoes ever mistreated you? With FootGloss, there’s no need to fear. Shoe lover Leah Schlechter was lining her favorite shoes with Band-Aids to prevent blisters. She wanted a better—and less noticeable—fix. She created FootGloss to help stop blisters from ever starting. It glides on and acts as a barrier, easing the friction that chafes your skin and leads to blisters. And because it’s invisible, it won’t put a crimp in your look, either. Made in the USA from all-natural ingredients, this balm works with any type of shoes—from high heels to flip-flops, hiking boots, men’s shoes and more. We found it can get a little slippery, so avoid using it on your soles. With just a swipe of this balm, the shoes that you love will now love you back.